This article first appeared on Telecoms.com. Telecoms.com periodically invites expert third parties to share their views on the industry’s most pressing issues. In this piece Ong Geok Chwee, CEO of Bridge Alliance, looks at the opportunities in IoT and the considerations when thinking about scaling IoT into Asia. The “Internet of Things” is a term we cannot avoid in this age. Yet, even industry experts still find it a challenge to grasp how its potential can be unlocked. This calls for design – designing with intention, rather than just letting things happen. This is important as we start wrapping our heads around IoT and the functions or people it will serve. Who or what will be using IoT? When and how does IoT come into play? And where will IoT be readily received? We often talk about IoT as a gold mine that many are sitting on. In fact, that that gold mine is in Asia – the leading region for IoT spending, accounting for more than 40 per cent of the total worldwide IoT expenditure in 2018. So how do we design our intelligently connected products for the Asian market? It is important to note that though seen as a collective region, the Asian market is highly fragmented. There is a significant variance in the urbanisation levels and characteristics of each country. Some are more advanced and have better infrastructure, while others have a larger population, with a wonderful climate for farming. This means that the use cases for IoT in these markets might vary, especially when we talk about scale. IoT solution providers might want to consider these variances and identify similar markets, so you may further refine your offering to serve a common need across multiple geographies. Feasibility is also an important element to the design phase. How do we design our IoT solutions to be cost effective? Keep it simple. The simpler your process, the more you save on unnecessary features that are not core to your offering. Take for example the use of a global eSIM, where from a manufacturing point of view, it is simply a single stock keeping unit (SKU). This optimises the logistics and distribution process, reducing the number of production lines required. The GSMA predicts that platforms, applications and services growth in the emerging IoT segment will soon surpass that of connectivity, capturing 68 per cent of the total by 2025. This means that IoT platforms are very much the focus. When it comes to platforms and technology, interoperability is critical. This is the trick behind the seamlessness of IoT, where platforms are the enabler of machine-to-machine connectivity. However, this means that there will be a huge advantage for whichever platform that captures the greater market share. In this case, the risk of a monopoly emerging is highly likely, which raises the concern of how the market will adjust to such a situation. Internet of Things, or Internet of People? We are ultimately trying to solve issues for people in our IoT designs. It is easy to get carried away when designing a solution with such complicated technology involved. We need to remember to simplify – the emergence of IoT came about with a purpose to simplify our lives and make things as seamless as possible. It is not just about the devices and platforms, nor just about connecting places and things, but about connecting the people. That is why we see the move towards customer experience and building relationships. This is also because the human connection is most often superior and an innate need, deftly enabled by the connectivity of things. Through this new age of IoT, we may understand people more through analytics, serve them better through experiences empowered by technology and delight them at just the right moment where it counts, through intelligence and the effective use of big data. Such an exciting time to be continuously designing, redesigning, testing and living in the world of technology and telecommunications. 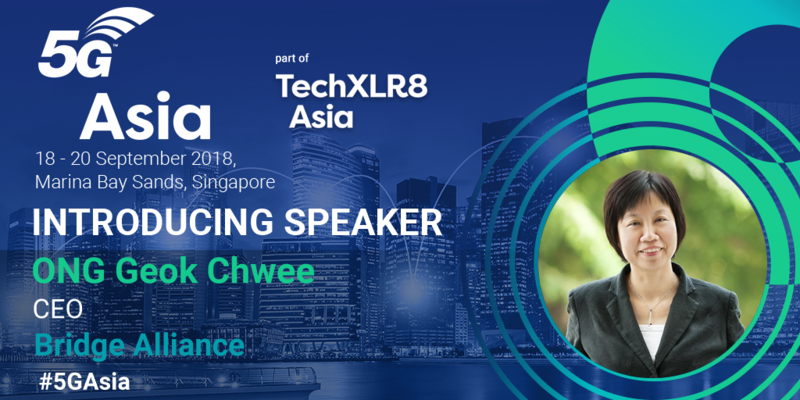 Hear more from Ong Geok Chwee at 5G Asia 2018 in Singapore this month, where she will be discussing what the telco of the future will look like in the CxO keynote panel and speaking on 5G for Massive IoT and M2M Communications.